Over the past 50 years, psychiatry has made some significantly large strides, but it needs a new direction. The current emphasis on psychiatric drugs works for now, but it is a temporary solution. Studies involving nurses, nursing, interventions and clinical work have led to a new type of treatment. Recent advances in the molecular biology of the brain and epigenetics have illuminated a new plan. The result? A treatment path for the creation of natural, drug-free, and effective therapies that do not produce severe side effects. The need-based treatments outlined in Dr. Walsh's Nutrient Power: Heal Your Biochemistry and Heal Your Brain show a research-based nutrient therapy system that can help people with a variety of mental disorders. The guide explains that nutrient imbalance can cause mental disorders by disrupting gene expression of proteins and enzymes, crippling the body's protection against environmental toxins, and changing brain levels of key neurotransmitters. Walsh's database has connected nutrient imbalances in patients diagnosed with a variety of disorders found in the DSM. This guide will show families, patients, and doctors how to change their behavior and improve their health through new skills that will last when psychiatric drugs are no longer used. Edition Statement Revised, Updated ed. "[Dr. Walsh] is a pioneer and a well-respected researcher. " "Over his impressive career, Dr. Walsh has worked with 30,000 patients with conditions ranging from autism to schizophrenia to Alzheimer's. 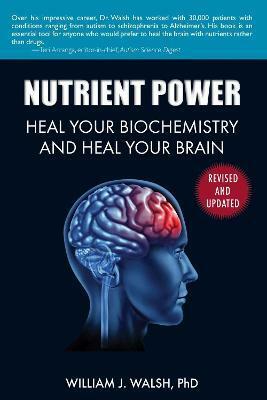 His book is an essential tool for anyone who would prefer to heal the brain with nutrients rather than drugs. " This could be an elegantly simple solution to the dysregulation of the extremely complex chemistry." " Bill Walsh is not a Renaissance man: he's a Renaissance scientist. He invented a lithium battery that has been used in cars and hearts; he won the Abram Hoffer Doctor of the Year award, although he is a chemical engineer; he found the physical causes of violence, sociopathic behavior, depression, schizophrenia, and a dozen other troubling behaviors-and he found the treatments too; his studies are elegant and often commissioned by the National Institutes of Health, and his work on autism is as original as the man himself. This book could change medical history. " "With Nutrient Power , Bill Walsh joins Linus Pauling, Carl Pfeiffer, and Abe Hoffer on the Mount Rushmore of behavioral nutrition. I was one of those doctors who emerged from medical school blind to nutrition. Bill Walsh opened my eyes to unsuspected nutritional needs, which saved my son. That could happen in your family, too. " " A necessary must for practicing physicians, patients and families! This book opens a new door in psychiatric healthcare. When all else has failed, read this book." "What began as a quest to help my then-3-year-old daughter has resulted not only in her recovery but has become the journey of a lifetime! Dr. Walsh is a revolutionary thinker who guides us into the emerging world of biochemical balancing, the growing body of research into epigenetics, and understanding how these fields relate so they can be applied right here, right now." Nutrient Power brings a unique new perspective to mental, behavioral, and autistic disorders, including the crucial role of epigenetics. Anyone seeking advanced treatments for mental illness will benefit greatly from reading Dr. Walsh's new book. " "[Dr. Walsh] is a pioneer and a well-respected researcher." "Bill Walsh is not a Renaissance man: he's a Renaissance scientist. He invented a lithium battery that has been used in cars and hearts; he won the Abram Hoffer Doctor of the Year award, although he is a chemical engineer; he found the physical causes of violence, sociopathic behavior, depression, schizophrenia, and a dozen other troubling behaviors-and he found the treatments too; his studies are elegant and often commissioned by the National Institutes of Health, and his work on autism is as original as the man himself. This book could change medical history." "With Nutrient Power, Bill Walsh joins Linus Pauling, Carl Pfeiffer, and Abe Hoffer on the Mount Rushmore of behavioral nutrition. I was one of those doctors who emerged from medical school blind to nutrition. Bill Walsh opened my eyes to unsuspected nutritional needs, which saved my son. That could happen in your family, too." "A necessary must for practicing physicians, patients and families! This book opens a new door in psychiatric healthcare. When all else has failed, read this book." Nutrient Power brings a unique new perspective to mental, behavioral, and autistic disorders, including the crucial role of epigenetics. Anyone seeking advanced treatments for mental illness will benefit greatly from reading Dr. Walsh's new book." Dr. William J. Walsh is a scientist with more than thirty years of research experience. He received his doctorate in chemical engineering from Iowa State University. Dr. Walsh has been working for the last thirty years to develop biochemical treatment protocols for patients with behavior disorders, ADHD, autism, depression, anxiety disorders, schizophrenia, and Alzheimer's disease. He is the author of more than two hundred scientific articles and reports. Dr. Walsh lives and works outside of Chicago, Illinois.